When seasonal allergies hit full force, it can really knock you down. Itchy red eyes, runny or stuffy nose, and all the “fun” stuff that comes from allergy season! 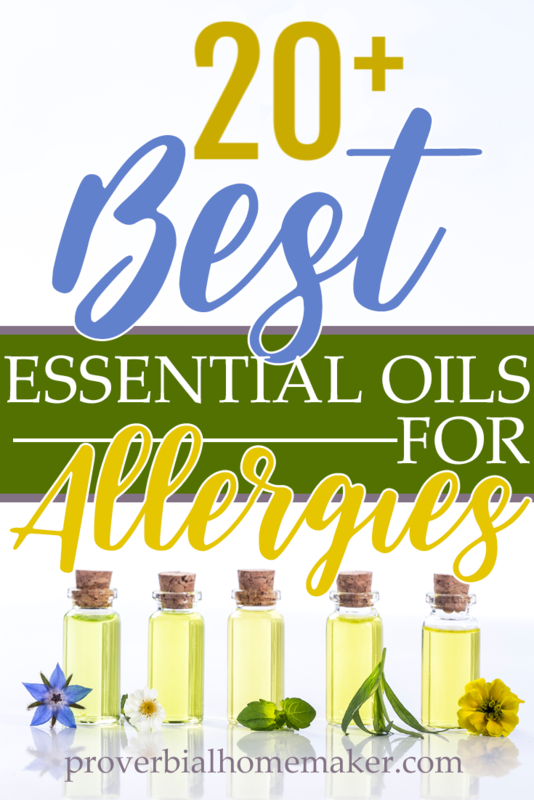 There are a lot of suggestions for how to use essential oils for allergies, but a lot of conflicting information out there. Never fear, busy mama! In this article, you’ll find just the essential oil information you need to easily address seasonal allergies in your household with success. Eight simple recipes to get you started! 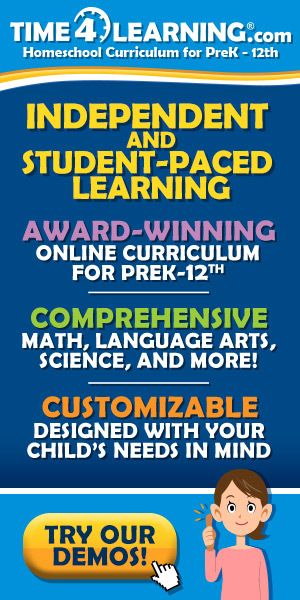 Free cheat sheet with all this info in one convenient download! First off, removing irritants from your environment can help with allergies overall and should be a preventative measure. Consider replacing harsh cleaners with more gentle and natural cleaners. Anything that is putting irritants in the air can impact lungs, and many people indicate that their overall seasonal allergy reactions go down once they start making good changes. Here are a few natural cleaning recipes to get you started. Also consider simple steps toward replacing personal products with solutions such as this DIY hand cleanser and simple perfume recipes. Start making one switch at a time and pretty soon you’ll have a household that is healthier. 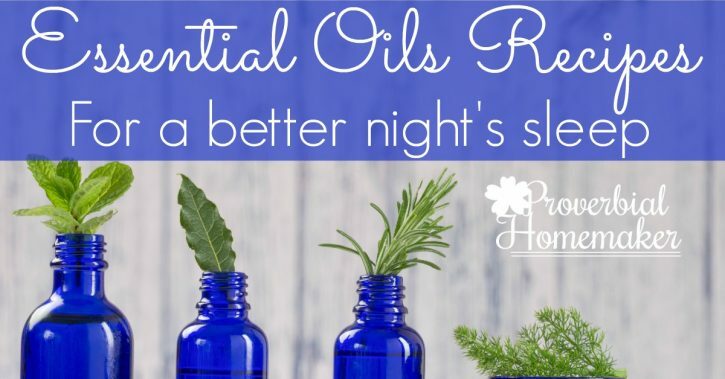 If you are struggling with allergy symptoms, there are several essential oils that can help. You can consider any of the below to be great oils that help avoid or soothe allergy symptoms. 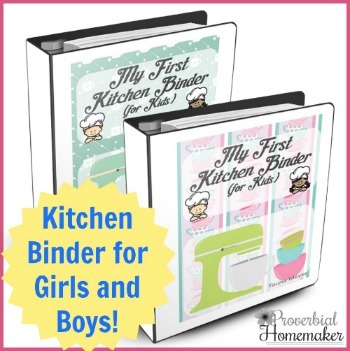 See which ones you have on hand a build a recipe from them, or use the recipes I’ve posted toward the end of this article as an easy way to get started. *** For a list of kid-safe oils and a cheat sheet you can download, go farther down in this post. Blue Tansy (Tanacetum annuum) – Can inhibit some over the counter drugs and those metabolized by CYP2D6. You can take any of the above oils and combine them in equal parts for an effective blend. Put 15 drops total in a diffuser – For example, equal parts Tea Tree, Lavender, and Cedarwood is a good combo. Make a 10ml roller bottle with a 4-5% dilution – 12-15 drops total and fill the rest with carrier oil. Make an inhaler – 6-10 drops total on the wick of an inhaler and cap for later use. 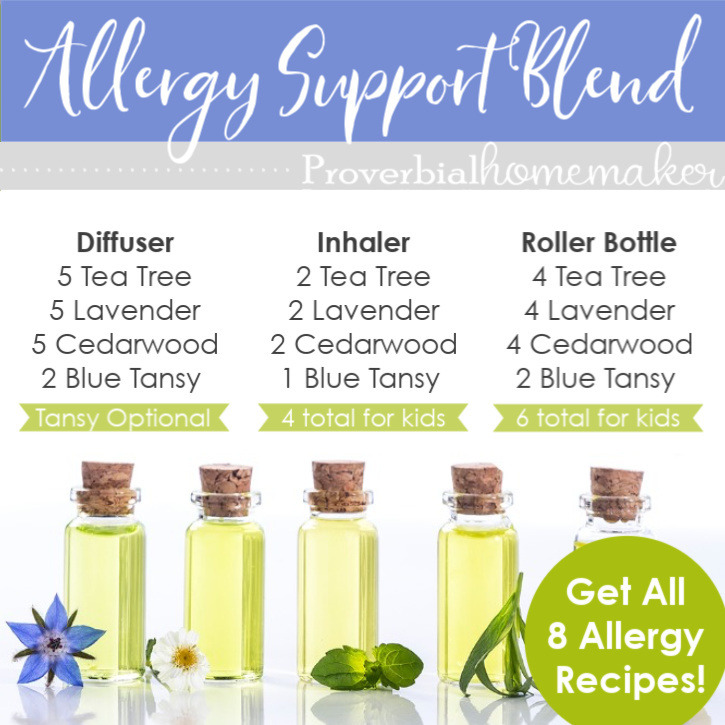 By the way, that Tea Tree, Lavender, and Cedarwood blend (in the recipe below) is very versatile and will help reduce sinus headache and congestion, calm allergic reactions, fight off infections, reduce inflammation, and boost the immune system. Add a drop or two of Blue Tansy if you have it! If you have kids, the list of oils and recipes changes just a bit for safety reasons. Not all oils are recommended for topical use or inhalation for kids depending on their age. Peppermint is the one most commonly (and erroneously) recommended for young children. Peppermint is not recommended for topical use or diffusing for kids under 6 years old (according to Tisserand in his book Essential Oil Safety). Other oils you want to be especially careful with and know the proper ages for are Ravintsara, Niaouli, and Eucalyptus Globulous due to their high content of 1,8-cineole. They can potentially cause respiratory issues and averse reactions you do not want for your kids. 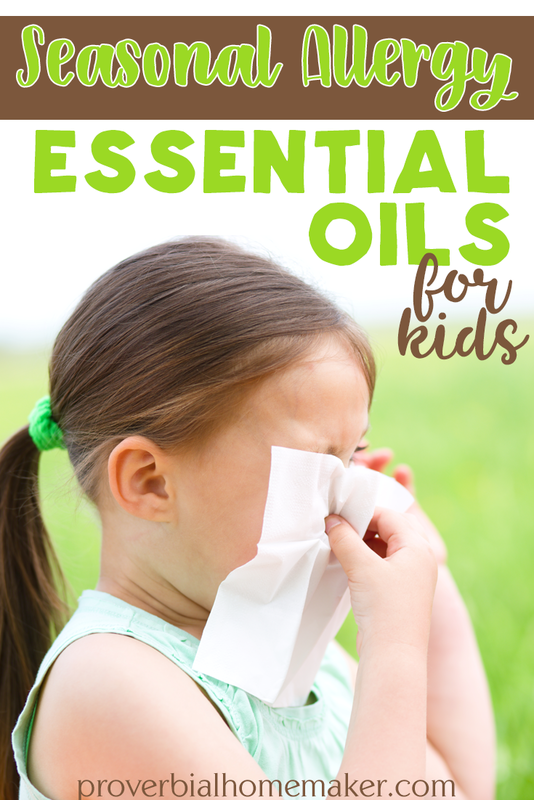 Here is a list of essential oils for kids seasonal allergies that are safe! Take any of the above oils and combine them to build your recipe. Keep the following dilution rates in mind. Always use the more conservative dilution rate to begin with and increase, up to the indicated maximum, until you’re satisfied with the effectiveness of the blend. For kids 2 to 5 years years old, use a 2-3% dilution or lower. For kids 12 and up, adult dilution rates are appropriate, but we still stick to 4% or lower, 5% for short term acute issues. How many drops should you put in your diffuser? The number of drops I indicate in recipes for a diffuser is based on a 500ml capacity diffuser. Generally, use 3-5 drops per 100ml capacity. Using too much oil can cause headaches, dizziness, and nausea. 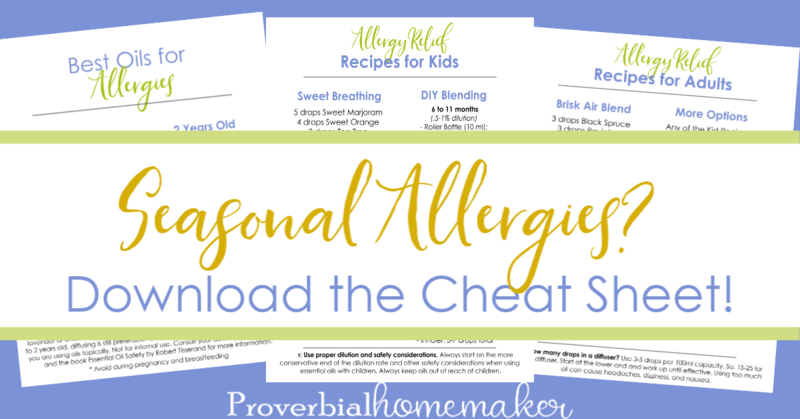 Download the Cheat Sheet + 8 Allergy Recipes! Want all this info in an easy reference format? 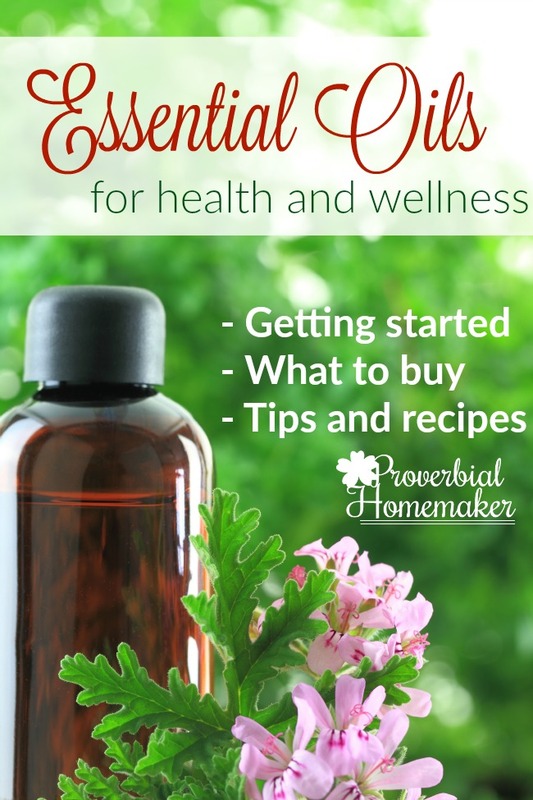 Download the cheat sheet, print it off, and either post it somewhere visible or start a binder with all my great essential oil tips and recipes! Plus, I’ve put together 8 recipes that you can start using now! I hope this is helpful, friends! Let me know if you have any questions. I put 3-4 drops each of peppermint, lemon and wild orange in my diffuser when my allergies flare up. Lavender makes me react even more, so I avoid it!